One of the most interesting and wonderful things to come out in 2003. 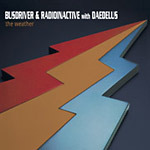 Witty lyrics from the duo of Busdriver and Radioinactive along with the electronic musings of producer Daedelus. I'm not sure if people are ready for this change of pace. It reminds me a bit of some beautiful Sergio Mendes grooves. Fresh fresh fresh, not your normal average every day. If I had to use one word to describe this album it'd have to be Creative, or Insane or Woozy. Sorry for the rambling, but it's really good.